Since the earliest times, successive rulers of Malta relied mainly on the local fighting men for the protection of the Maltese Islands. In an emergency, the Islanders were often rallied for the defence of their homeland. These non-regular forces were in effect organised groups of trained and armed civilians, more appropriately known as the ‘Milizia’. 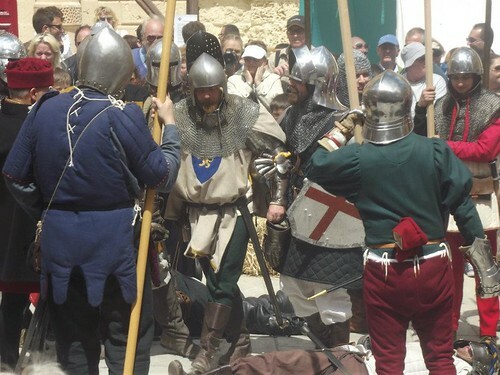 On taking over Malta as their operational base, the Knights of the Order of St. John quickly organised the Maltese Militia into a highly efficient defence force. The Militia forces were arranged into two main elements; the ‘Milizie Urbana’, and the ‘Milizie di Campagna’. The ‘Milizie’ were divided into regiments, with each regiment officered by a Knight, with Maltese adjutants, sergeants, corporals and clerks assisting this officer. These regiments were subdivided into a number of companies, with each company totaling approximately 100 men, averaging from 16-60 years of age. The Militia also gave vital service to the ‘Guardia Torre’, responsible for manning the various towers, gun batteries and redoubts. These ensured that the relay communication system between the towers was operational on a daily basis. Another vital rote was that of the ‘Guardia Costa’, involving the manning of the various entrenchments defending our coastline from any enemy landings, also conducting regular foot patrols along the coast. The Maltese militiaman did not normally receive any pay, the exception being some particular regiments, within the Urban Militia, and the subalterns of the Country Militia who received an allowance. As for dress the Militia soldiers, apart from some urban units were not issued with a uniform, however; no doubt their officers strongly encouraged any efforts at achieving uniformity of dress.